This site requires Adobe Flash Player Version 10 or better. Click here to download the flash plugin. Bathtub refinishing, coatings, and supplies of the highest quality have made Munro Products a leader in the bathtub refinishing industry since 1972. Their bathub refinishing supplies and services, and over 30 years experience, will help with even the most difficult bathtub restoration projects. Created by the professionals. Used by the professionals. 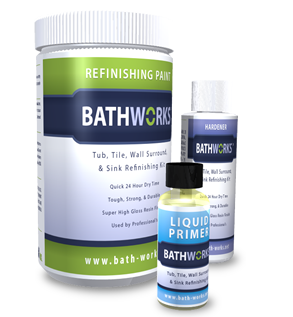 BATHWORKS is a top of the line, Commercial grade Bathtub and Bath Wall refinishing kit formulated to provide an extremely glossy, very durable, long lasting finish. This DIY bathtub refinishing system is used all over the country in residential homes as well as Marriotts, Sheraton, Homewood Suites, and more. 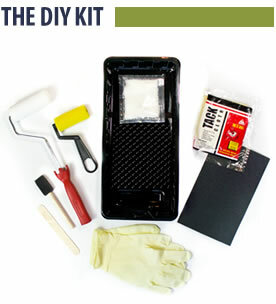 ** Kit shown with optional 3" roller, which is included only with the "non-skid" kit. TubWorks is a division of Munro Products Bathtub Refinishing Service.